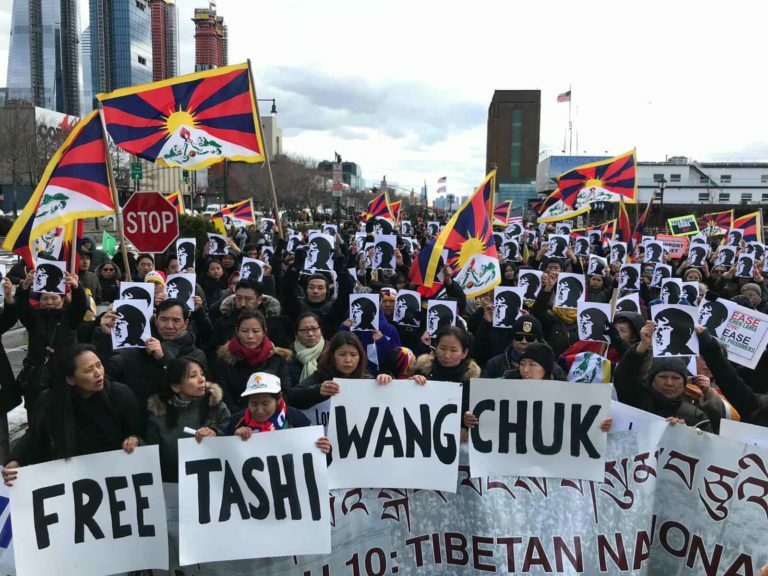 NEW YORK – Tibetans and local supporters – gathered en masse to call for the immediate and unconditional release of Tibetan shopkeeper and language advocate Tashi Wangchuk, who has been sentenced to five years in prison by Chinese authorities. Tashi stood trial in January of this year after two years of arbitrary detention by Chinese authorities for the New York Times’ documentary on his legal challenge to China on language policies affecting Tibetans. Mr. Tashi, 33, was arrested in early 2016, two months after he was featured in a New York Times video and article about Tibetan language education. He stood trial in January this year, charged with “inciting separatism” for comments he had made to The Times. The protests follow condemnations and expressions of concern by the E.U., Canada, France, and the U.S. among key world governments. At the Chinese Consulate, Tibetans flags and banners calling for ‘Free Tashi Wangchuk’ could be seen across the road from the entrance. said Dorjee Tseten, Executive Director of Students for a Free Tibet. Sonam Wangdu, Chairman of the U.S. Tibet Committee and one of the first Tibetan settlers in New York, expressed his dismay at Tashi’s sentence. The organizers are calling for an immediate and unconditional release of Tashi Wangchuk, and have a petition at sfthq.cc/TashiPetition for his appeal. Similar protests for Tashi Wangchuk are taking place and being planned in other cities around the world.